In recent remarks at the Center for Strategic and International Studies (CSIS), U.S. Secretary of State Rex Tillerson suggested that “India needs a reliable partner on the world stage…the United States is that partner.” However, India should respond with caution to friendly overtures from a government that views foreign policy primarily in transactional terms. Despite Tillerson’s repeated allusions to a “100 year” partnership, India should not be fooled into thinking that the U.S.-India honeymoon will last forever. In the context of the United States’ ambition to reassert its relevance in the Asia-Pacific, India’s growing military and economic power may soon fall afoul of U.S. President Donald Trump’s deal-making calculus. The administration’s transactional mindset is further complicated by the emotional volatility of Trump himself, who seems to use Twitter as his primary foreign policy tool. Even if Tillerson can teach Trump to respect diplomacy, the current U.S. foreign policy formulation will necessarily expire within either four or eight years. Keeping in mind the short-lived and volatile nature of U.S. foreign policy, India should not only remain vigilant, but also try to make the best out of current U.S. overtures. It may have a short window of opportunity to pursue three key steps and shape the game in its favor. First, India should utilize its improved relationship with Japan to reshape the power dynamic in the U.S.- India dialogue. Though India has historically been an underdog in bilateral discussions with the United States, China’s rapid rise has forced Washington to become more accommodating with its Asian partners. India can capitalize on this opportunity by strengthening its partnership with Japan, another ally of the United States in its strategy to contain China, and ensuring that Japan and India negotiate with a united front. After Prime Minister Shinzo Abe’s successful visit to India in September, recent India-Japan joint military exercises are another step in the right direction. But India should do more to strengthen the partnership, and soon. Like India, Japan is becoming more cognizant of the risks of relying too heavily on the mercurial Trump administration. India has a rare opportunity to step into the void. Second, after rebalancing the power dynamic by aligning more closely with Japan, India must ensure that the U.S.-India dialogue more accurately reflects Indian interests, and not just American demands. Near-term issues pertaining to Pakistan and Afghanistan are more “zero-sum” in nature, so India should not shy away from trying to claim value for itself by playing “hardball” (the United States will surely do the same). For example, India should continue to urge Washington to pressure Pakistan on terrorism, even though India knows that the United States wants to use Pakistan as a tool to achieve its strategic interests in Afghanistan. Relatedly, India should emphasize that any moves it makes, such as recent aid deliveries to Afghanistan at the United States’ request, are to be reciprocated by tangible concessions from the Trump administration. Third, if Washington demonstrates willingness to reciprocate on near-term issues, New Delhi should seek to shift the relationship from transactional to a long-term partnership. Despite Trump’s focus on the “art of the deal,” mutual concern about China’s economic power and geopolitical bellicosity could become the linchpin in a more durable partnership. While the two countries’ positions with regards to China are not entirely the same, there are still several shared underlying interests that can serve as starting points for a joint strategy. For example, India should consider more seriously the United States’ offer to help India develop an infrastructure program to counter China’s “One Belt, One Road” initiative. While India will not be able to rival the scale of China’s program, such a program could be an important step in creating shared economic interests to underpin the U.S.-India strategy toward China. 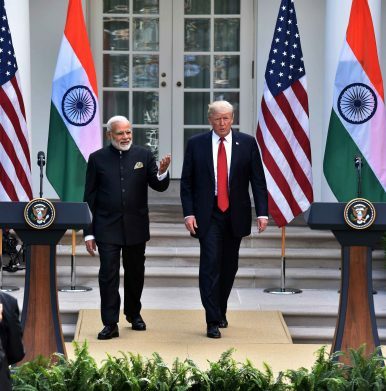 Because Trump has shown that his loyalty doesn’t run very deep, India should approach its new bonhomie with the United States with a cautious optimism. Though the aforementioned issues are undoubtedly complex, by utilizing a deliberate strategy to reset the U.S.-India relationship, India can more effectively shape the Asia-Pacific game in its own favor. Riju Agrawal is currently pursuing the MBA/MPP joint degree at the Harvard Business School and Harvard Kennedy School of Government, where he was selected as a Rubenstein Fellow. "New Delhi would do well to use Xi's visit to study the key principles of negotiating with Trump." What a Trump Presidency Means for PakistanIndia Opens Door to Japanese Assistance in Andaman and Nicobar IslandsIran’s Chabahar Port Scores an India- and Afghanistan-Inspired Sanctions ExemptionOne More Tryst for Modi and Abe: What to Expect During the Latest India-Japan SummitAs Modi Gears Up to See Abe Again, What's Holding Back India-Japan Ties?